The ethos for this surveillance camera system from Zmodo was to design an all purpose day & night vision system for a multitude of scenarios in the home and workplace. This innovative 8 channel monitoring system has upgraded the camera resolution to the 600TVL format, but Zmodo have still managed to keep the cost down. This is a bargian. If you have a busy schedule a Zmodo Series Security Solution allows you to go about your business and leisure, giving you the assurance that your home or business, or storage facility is being safeguarded 24-7. 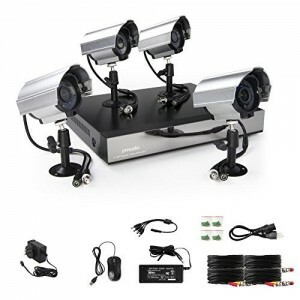 This sophisticated 8 channel total security solution with 4 hi-resolution (600 TVL) night vision cameras that can be completely controlled via a Smartphone, Tablet or computer. With movement triggered push notifications, email alerts and easy Smartphone viewing options, this Zmodo surveillance system offers you real, 24/7 surveillance protection you can monitor regardless of your actual location. All Zmodo DVRs feature a complimentary Smartphone App called “Zviewer”. Free for both Android & Apple (iOS) and enables access to your camera videos any time from throughout the world. Use your smartphone to log in to your camera system even if you are on the other side of the globe. Want A Free DDNS Server Courtesy of Zmodo? There is a FREE DDNS service available with this system. Once you register with a DDNS service, you can choose a host name instead of a computer IP address, the DDNS service will propagate the IP address to your new host name once set up correctly. Cam Management Software (CMS) makes all Zmodo DVRs available over the web on your PC via the software application. 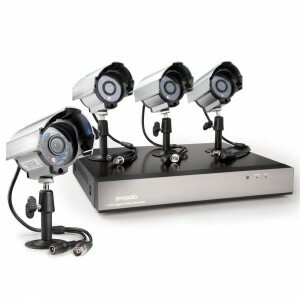 Peace of mind is assured with the watchful Zmodo 8-channel security DVR. Capture footage from up to four cameras at the same time in D1 with a pixel resolution of 704 x 480, capturing at 30 frames a second, or alternatively eight electronic cameras in D1 at 15 frames per sec. Stream footage to your tablet, PC or phone over the GSM network. The improved movement detection settings make sure only real motion triggers the alarm system. The movement detection mask quickly enables you to ignore locations with consistent movement, like tress or roads. You will receive a real time email alert with an image attachment sent directly to your smartphone or tablet when a cam spots movement. Connect 1 BNC and 1 VGA video output, so the signal from the DVR is watchable on your TV or monitor. View all video cameras simultaneously on a split-screen, or view individually or alternatively cycle through each of the electronic cameras at an adjustable speed. Continual recording can be enabled on the DVR, and you can schedule specific time slots for recording. You can arm the system for motion sensor recording. Each separate cam can be given personalized settings. Navigate swiftly through recorded video footage via channel, date or time specifications. View all video cameras at the same time on a split-screen, or view 1 electronic camera at a time on complete screen mode with the choice to cycle through each of the cameras at variable speeds. You can also see the video feeds in a 4 video camera or 8 electronic on-screen grid. This DVR has a simple to use cutting edge interface. Simply point and click the icons to access any of the functions of the DVR. Also comes supplied with a USB mouse. 5 actions concurrently can be handled by the Pentaplex system. You can record, playback, watch live, back up your files from a separate location and also monitor your footage from another location, all without any loss of footage or recoding time. Includes a very robust 500GB A/V specialist hard drive with quick rewrite speed. System can handle up to “TB SATA HD. You can transfer your footage to a PC, USB drive, or a Flash Drive. Enhanced superior quality footage is captured via 4x 600TVL high-res commercial grade electronic cameras with superior sharpness, and excellent low light and nigh vision clarity. Aluminum casing ensures cameras can survive all weather scenarios. Viewing at all angles thanks to adjustable wall mounts. Great for covering all blind spots. All cameras have 11 super bright long lasting LED’s with a range of 50ft in complete darkness. Eliminating fuzzy pictures. The extreme wide angle 6mm lens picks up a wider surface area which is great for awkward bigger locations like driveways, entrances, stockrooms, big stores, parking area, front and backyards, areas with obstructions. If you are handy at DIY all the necessary cables and accessories are supplied. If you run in to diff’s you can arrange it to be set up by InstallerNet (U.S. only). Thanks to H.264 video compression and CMOS technology these extremely rugged security cam’s provide excellent coverage for day or night time monitoring. Taking excellent advantage of wireless technology you have the versatility of logging into your system any time of the day, at any location you happen to be in. Employ a security company or personnel to monitor your footage, or keep a computer window open at home or the office. What’s even better is the system will automatically contact you if it detects a threat. Once you enable cloud back up recording, you have a complete system that has a backup so you can deter and prosecute intruders. All in all a great cheap system with excellent resolution.